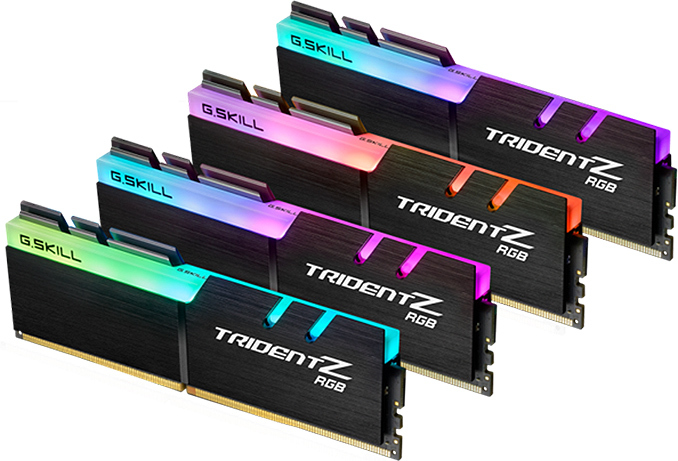 G.Skill traditionally announces products weeks before their actual availability, so expect its 16 GB DDR4-4800 and 32 GB DDR4-4500 dual-channel kits in November or December. Pricing will depend on market conditions, but since we are dealing with unique and exclusive products for enthusiasts, expect them to be priced accordingly. 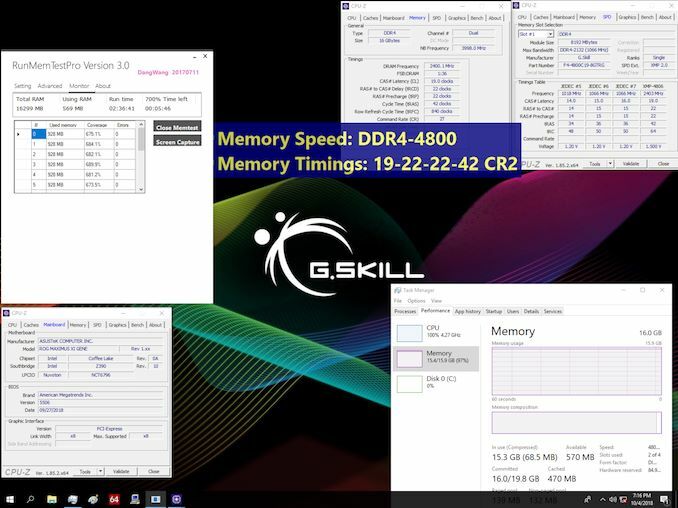 Right now the fastest thing G.Skill sells are dual-channel 16 GB DDR4-4600 kits priced at $384 - $500, depending on the color. 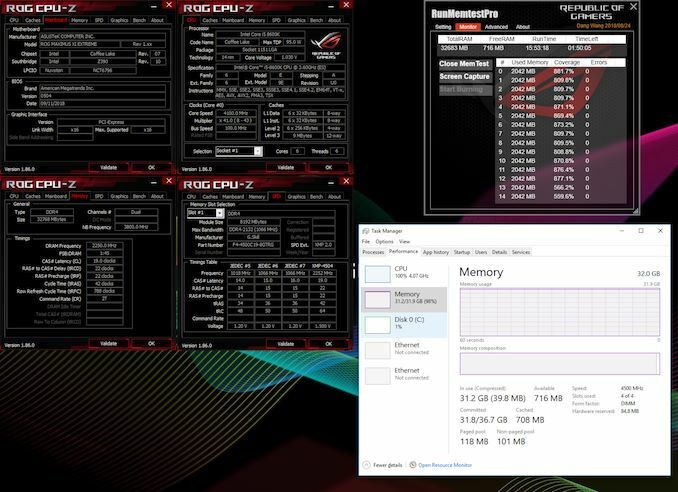 So, the new flagship DDR4-4800 kits will either be in the same range (pushing DDR4-4600 lower), or will go higher. I'm in the process of building a new machine (i9-9900k). From what I've read I want to look for the lowest (CL * 2000)/(Speed). I want 64gb. My current machine I average 40-50gb of usage. I'm a software developer and run a lot of vms. I was all set on some G.Skill 3200 CL14 which would be (14*2000)/3200 = 8.75. I can't really find any other memory in the same price range that yields similar or lower numbers. Their current 4600 is CL 19 which would be 8.25, great, but only comes in 8gb sticks so I would max out at 32gb. I do see they say this will come in 32gb pairs. (19*2000)/4800 = 7.91. Comparing numbers (8.75 vs 7.91) does that mean I would really be another 10% faster? Is 3200 CL14 the current sweet spot? 3200 CL14 is the best because it means the RAM is Samsung B-Die which is the best ram available. Cost is where you're going to lose, obviously. But again, if you're doing this for Actual Work, you should be able to either deduct it or get someone else to pay for it. I've researched dual vs quad before and never found any major benefits to it. So I've researched it again and still not really seeing anything. Maybe a 'slight' improvement in zipping a file. Could you share any links that truly show quad channel really being worth it? with the HEDT CPU (9800X) you get the full 44 PCIe lanes to the cpu. Optane PCIe storage hooked directly to the CPU might be of interest if you do high I/O work that benefits from low latency. That's not how memory works though. Basically for every 400Mhz you increase speed, Cas Latency can go up by 2 while providing the same actual latency. This means that a 3600hz CL16 kit is operating at the same latency as a 3200Mhz CL3200 kit, but at higher bandwidth. Så basically higher clocked memory should always result in better performance as long as Cas Latency does not increase by more than 2 per 400mhz. This is obviously a simplification since some workloads do not scale with memory bandwidth and you would be better off getting even tighter timings. I would recommend finding a good B-die kit (3200 cl14 or 3600 cl16), maybe the Dark Pro Xtreem, that's good value for the money, and seeing how tight timings you can get at 3200, then how high bandwidth you can achieve without sacrificing timings too much, and then testing each setting for your workloads.